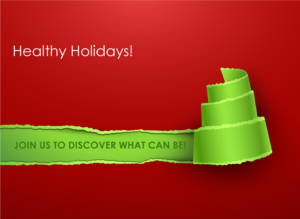 Are you tired of getting sick right around the holiday season? You work all year to enjoy time off with your loved ones and end up not enjoying it at all…here are some tips to help you avoid that this year. Supplement with Vitamin D. One of the reasons people are more susceptible to illness this time of year is the lack of Vitamin D. With the cold weather and shorter days, you are outside less often which means your body is not soaking up the sunlight and unable to make Vitamin D. Supplementing can help you bridge the gap until Spring. Get more sleep. Try to fit in 8 hours each night if possible, if not make room for yourself to sleep in on the weekend or take naps. Sleeping is an important time for your body to repair itself and allow your immune system to do its job. Take a walk. Even though it may be cold, you still need to get in some exercise. Exercise stimulates the immune system so that you are less likely to get sick. Just FIYI-Walking 20 minutes 3 times a week has been proven to reduce the risk of a heart attack by 50%! Eat healthy. Don’t go crazy over the holidays, it is as simple as that. Enjoy a meal or two without restrictions but don’t go overboard! Bombarding your body with sugar and unhealthy food is another reason people get sick more this time of year. Get adjusted by a Chiropractor. The adjustment stimulates the immune system and helps your body to function at its optimal potential. Studies have shown that immune response is improved following an adjustment, in some cases over 200%! Learn more about the adjustment and immune function by clicking this link.